There are currently 25,211 users on this website. 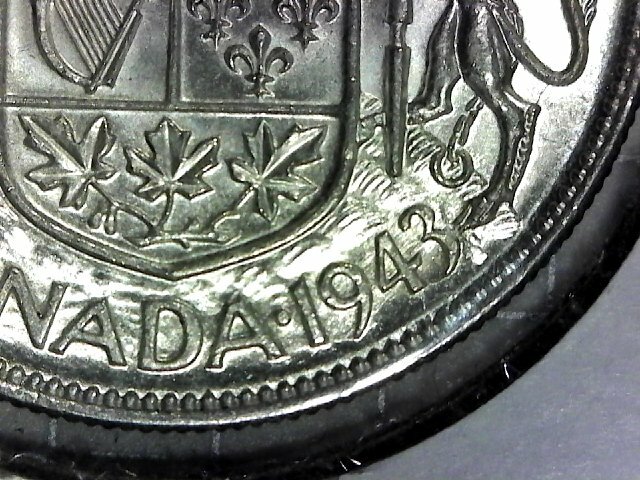 I recently acquired a nice 1943 Canadian half dollar. I need help identifying the variety. Charlton shows three varieties: Narrow date near 3; wide date far 3; and wide date 3/3 far 3. I believe my coin is of the wide date variety but I'm having trouble determining if it is a 3/3. Can anyone help? I hope the picture is clear enough. there are actually 12 varieties for the year 1943.. other than that I can't tell you for sure which one you have.. Since the last two date digits are entered manually for the 1943s and the mint figures say there were 118 reverse dies used, then there are 118 date digit positioning varieties. Of these there are at least 24 different '3/3' double punches incurred in the manual entry of the date digits....... unfortunately your 1943 in not one of those. It is a nice wide date, high3 variety..
Charlton's 2014 68th Edition had a Variety section that detailed the George VI 50 cents in some detail. f you are interested in this series, it would be a good acquisition if you can find one on Amazon or some other site. Thanks everyone for the feedback. I wasn't aware of the fact that so many varieties of the George VI 50 cent coins exist. Explains why I couldn't match my coin to the 3 pictured in the current Charlton catalogue. I may stick with just creating a date collection first before branching out into collecting various varieties. I may pick up a copy of the 2014 Charlton that was suggested. I saw a number of used copies available online. Concur that there are too many date positioning varieties so I have gone for the wide and narrow dates and these are what are pictured in Charltons. Of course all double punches are fair game.